The Growing Threat of a Major Space Debris Collision -Is the ISS in Danger? In January, 2011, the European Space Agency’s huge Envisat Earth remote-sensing space satellite was nearly on the receiving end of a spent Chinese rocket stage. Space junk tracking information supplied by the U.S. military, as well as confirming German radar data, showed that the two space objects would speed by each other at a scary distance of roughly 160 feet (50 meters). ESA's Envisat tips the scales at 8 tons, with China's discarded rocket body weighing some 3.8 tons. A couple of tweaks of maneuvering propellant were used to nudge the large ESA spacecraft to a more comfortable miss distance. But what if the two objects had collided? A headon space collision of this magnitude would have caused mayhem, adding clutter to an orbit altitude where there are already huge traffic jams. In 1978, the NASA scientist Donald Kessler predicted that a collision between two pieces of space junk could trigger a cascade of further impacts, creating dangerously large amounts of debris. 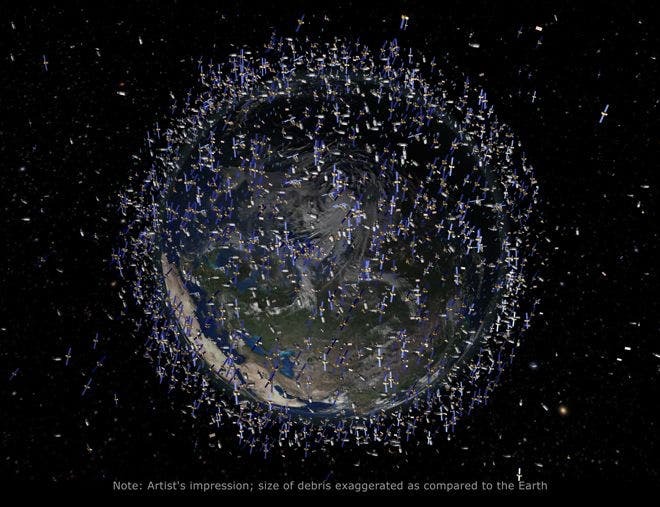 Kessler pointed out that when the rate at which debris forms is faster than the rate at which it de-orbits, then the Earth would become surrounded by permanent belts of junk, e.g. the Kessler Syndrome. By some estimates, the Kessler syndrome has already become a reality. In January 2009, a collision between the Iridium 33 and Cosmos 2251 satellites created just this kind of cascade. Two years earlier, the Chinese military tested an anti-satellite weapon by destroying one of its own satellites called Fengyun 1C. Both incidents took place at altitudes of about 800 km. Today, the European Space Agency's Earth observing satellite, Envisat, discussed above, orbits at about this height and is regularly threatened by potential impacts. Over 60 per cent of these threats can be traced back to the Iridium/Cosmos collision or the Fengyun incident. While space junk threatens most space operators, few have a real incentive to do anything about it. If a significant threat arises, it's usually possible to move a satellite out of the way. That's much cheaper than actually clearing the junk. James Mason at NASA Ames Research Center near Palo Alto suggests a much cheaper option: to laser-adjust individual pieces of junk with a ground-based laser, thereby slowing them down so that they eventually de-orbit. In the 1990s, the US Air Force studied the idea, thinking that a powerful enough laser could ablate an object, creating a force that could be used to de-orbit it. The trouble with this idea is that such a powerful laser has an obvious dual purpose, which is unlikely to please other space faring nations. As a result, Mason studied the possibility of using a much less powerful system which uses the momentum of photons alone to decelerate the junk. Focused onto a piece of junk for an hour or two every day, a 5 KW laser could solve the problem. The laser solution could move up to ten objects a day away from potentially dangerous orbits and ultimately to de-orbit it entirely. Mason says that the system could reverse the Kessler syndrome, so that the rate of debris removal once again exceeds its rate of creation. It's only a matter of time before we have our first seriious space junk event, threatening, for example, a crewed mission, for example.